Last week, the weather was so fair, I was able to venture out of the house with just a light top and a thin trench. After my youthful shopping mistakes and there were quite a few, I learned to buy classics. And, when I think classic, color beige always come to mind. With all my beige purchases, I can't say I regretted any decision. Going out the other day, I decided to go with comfy beige look. Although beige should be boring technically, if done right, beige can be rather charming. Do you like beige?? Using different beige and cream tones to create layers. I shorten straps on the inside with a elastic band to make the bag a handheld. To add some sparkle, I added the Dazzle Rivoli necklace to the outfit. Boy, did I sparkle that day!! Such a necklace should be over the top during daytime but it is surprising fitting with this look. I can imagine wearing this necklace under a polish shirt and suit to the office or meeting. If I wanted to be more casual, the I ditch the necklace and wear this pair earrings instead. 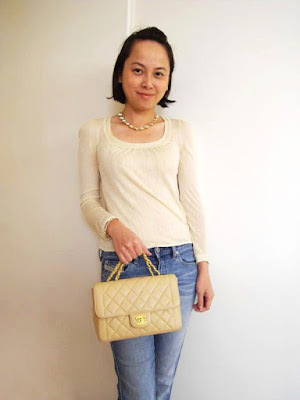 What I am wearing: Coach trench, Emporio Armani knit top, Diesel jeans, Chanel bag, Jewelries by Angela M. Design. Beige is so classic and chic! Very charming indeed! I adore this trench coat and this bag together, so perfect. Awhhh, great choices...classy trench with No. 1. bag! I don't think you can ever go wrong with beige - especially in the form of a trench coat. I adore beige especially in the shape of a classic trench. It's a lovely neutral that can pair well with most colors. Absolutely loving that coat. Really looks good on you. And your bag is so pretty. beige is definitely not boring. like the different hues. Beige is definitely a classic. Can't go wrong. Love your bag. The trench coat is totally rocking! You can't go wrong with a beautiful and timeless beige trench coat! P/S: Come by and enter my current Kirkland's gift card giveaway if you like! Hooray to good weather! Cute trench and top. You are always so easy on the eye. I love beige but I don't really own anything in that colour. You look lovely- great trench and awesome bag! Gorgeous trench coat! Love it in beige. Loving your trench!! Also loving the Chanel bag. Totally jealous of it! Beige is one of the staples in my wardrobe - it can be paired with anything and brightened up with a few colourful accessories if required. I love it in summer, in floaty fabrics and in winter in knits! Thanks for your lovely comment. Am following you and look forward to reading more! Love this Parisian chic look. You look adorable...happily following you blog ! !